Cuphead has been in the works for so long it’s hard to tell whether the game deliberately calls back 1930’s animation or if that was when the developers first started working on the game. Either way, Cuphead is finally out, and it beautifully pre-retro artistic design is enough to make this game stand out for years to come. While I’m sure we’ve all been seeing the reports online of issues with the game crashing and a number of bugs hampering play, these seem largely contained to the PC version of the game. On Xbox One, everything flowed smoothly and I didn’t encounter a single crash or noticeable bug. I did, however, encounter a lot of bosses. What I thought was going to be a rock hard platformer with some insane looking bosses was actually more of a boss arena game with the occasional, intermittent platforming world. Think Titan Souls or Yuri, not Rayman. I think I would have preferred more of a chance to explore the absolutely incredible world they created, but the boss fights are addictive and challenging. With so much focus on the dozens of bosses you’ll come across, there is a lot of imagination and variety in the boss fights. Early on you’ll be fighting casino frogs and psychic vegetables before moving on to clown rollercoaster hybrids and, finally, the devil himself. Every boss has their own pace, rhythm and attack patterns to master, and you will have to memorize all those to beat them. In fact, for each boss, I probably had to spend ten minutes or so just memorizing their style. Like so many game bosses, each one changes up their routine multiple times during the battle, forcing you to learn and relearn as you progress. To say that they are difficult might not be very accurate because unlike some games the end is always in sight. Cuphead doesn’t attempt to disguise the weaknesses or the attack pattern of its bosses. In fact, in a lot of the encounters, its melodramatic animation actually highlights what you should be doing. Moves are often telegraphed with more than enough time to react, and each boss has a particular rhythm that syncs with its movements making anticipation easier. All of this does mean that you will have to fight them several times, and even once you’ve learned the nature of the boss, you’ll then be putting your skills to the test, but never feeling overwhelmed. It never seems impossible. That might be why it feels so addictive to keep coming back to. Every death is a lesson you can bring to the next fight, and quitting before you defeat the boss feels wholly unsatisfying when you’re confident you could beat it with one more go. But then, like me, you’ll always be racing to find the next boss anyway. The animation, soundtrack and atmosphere of the game are all just outstanding. 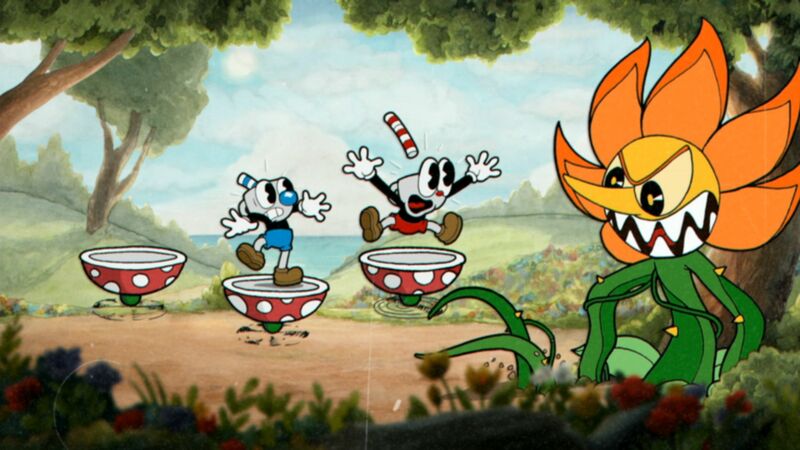 Taking inspiration from those old cartoons we’ve seen referenced in media for years, Cuphead lets you live it. Everything from the backgrounds to the way the characters move with big expression gestures feels true to the medium it’s emulating. Even the story feels like a throwback to a fabled time that none of us have any first-hand experience with. Having gambled their souls against the devil, Cuphead and his friend Mughead are now collecting souls for Lucifer in an attempt to save themselves. Heavy-handed moral overtones against a backdrop of slightly unnerving characters feel like something out of the 1920’s. Like Bioshock Infinite’s Dimwit and Duke, it feels period accurate even if we know that isn’t the case. Having said all that, this won’t be a game for everyone. If it were a platformer, even a challenging one, I’d be quicker to recommend it, but not everyone will be enthralled by a series of boss battles. Unlike Dark Souls, there is no grind that can improve your character before the fights, no levels to ding or equipment to loot. If the idea of playing the same bosses several times each isn’t appealing to you, or getting annoyed that you didn’t quite react in time, there are other games better suited. This is a game designed with challenge in mind, and an easy to goal to lure you. Some things are easy enough to learn while others take a lot of practice. 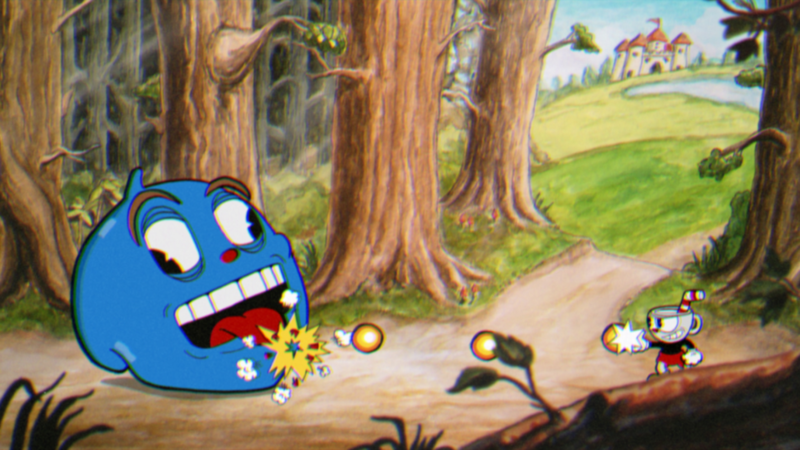 For instance, after nearly a dozen hours as Cuphead, I still haven’t managed to perfect the counter jump. Players can bounce off pink items with a second jump, but it feels strangely unpredictable with some enemies and objects seemingly easier to counter than others. Unfortunately, it is not a game with multiple playstyles in mind so if this doesn’t sound like your kind of game, don’t think you can make it more fun for yourself by finding other ways to beat the bosses. With great design, imaginative enemies and fantastic atmosphere, the only thing that really lets it down is its stiffness. Reviewed on Xbox One (code provided by the publisher). You can buy the game via Amazon.